The Marina Village Inn provides spacious and well-appointed guest rooms and family rooms that range from a standard king, accessible king, double queen, superior rooms, and king suites. Each non-smoking guest room features comfortable bedding with soft linens, modern décor, complimentary WiFi, and flat screen TV’s with premium cable channels. For added guest comfort, our guest rooms feature a refrigerator and microwave, a coffee maker, and an in-room safety deposit box. Our guest rooms also feature spacious and private bathrooms that are equipped with soft towels, complimentary toiletries, and a hairdryer. Select rooms feature beautiful views of the marina, while other rooms include private balconies that allow guests to relax and take in the natural beauty and soothing water sounds of the marina. There is a fee of USD 25.00 for early check-in. There is a fee of USD 25.00 for late check-out. We have a 24-Hour Cancellation Policy. If you wish to cancel or modify a reservation, you must do so by 2 PM 24-hours or 1 day prior to your arrival date. If you cancel or modify post the expiration of the Cancellation Period or you fail to show up, a no-show charge will be levied on your credit card for one full night. 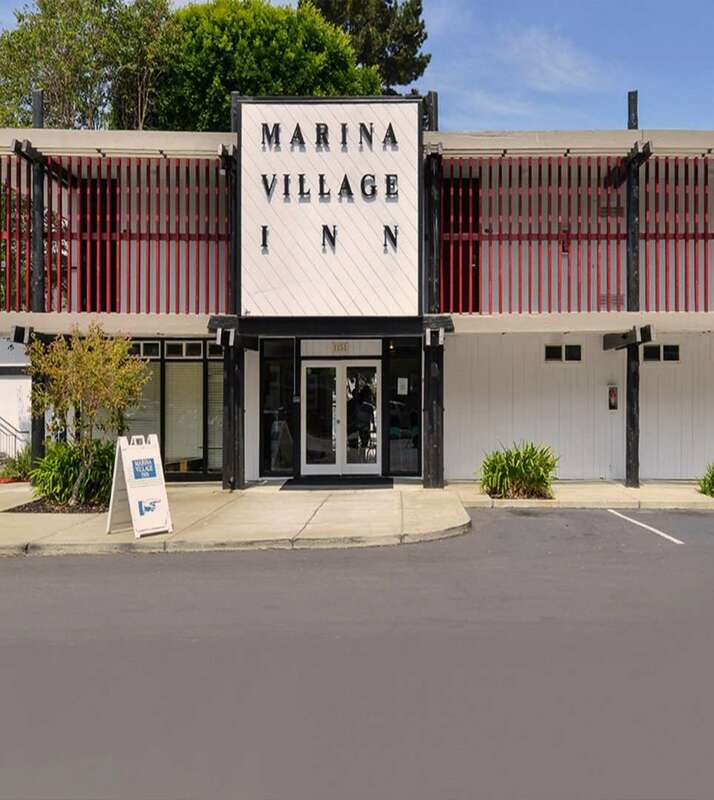 The Marina Village Inn is adjacent to the Alameda Marina in Alameda, California; providing convenient access to Oakland, Berkeley, San Francisco, premium shopping, entertainment, Shoreline Park, and the Encinal and Oakland Yacht Clubs. Additionally, our location is minutes from the Oakland International airport (OAK), and the San Francisco International Airport (SFO). The Marina Village Inn is a 100 % smoke-free hotel. We are pleased to provide guests with services like a complimentary continental breakfast that is available every morning from 6 am – 10 am, and concierge services. Guests can also take advantage of the 24-hour front desk with complimentary newspapers in the lobby. Other services include luggage storage and complimentary use of a nearby fitness center. Free onsite self-parking is available. Complimentary parking is available for guests. Complimentary WiFi is available for guests of the hotel. Children are welcome! Children 16 years of age, and younger stay free when using existing bedding in the same room with a parent or guardian. Cribs are available upon request for a fee of USD 15.00 per night. Rollaway beds are available upon request for an additional fee of USD 15.00 per night. The maximum number of extra beds or cribs per room is one. ADA Defined Service Animals are welcome at our hotel. Sorry, for the consideration of fellow guests, Marina Village Inn does NOT allow pets. This property is privately owned, and the management reserves the right to refuse service to anyone and will not be responsible for accidents or injury to guests or for loss of money, jewelry or valuables of any kind. Once checked in, no cancellations. All linens are inventoried: missing or damaged linens will be charged. Any damages to hotel property will be charged an additional fee upon assessment. This is a NON-SMOKING facility. Guest acknowledges that smoking is not allowed in a guest room or within hotel facility. If anyone in the guest's party smokes in the guest room, guest hereby expressly authorizes hotel management to charge credit card the amount to reimburse the property for the additional cost of cleaning guest room. A security deposit via credit card will be required upon check-in and will be charged in the event that damages outlined herein occur. A valid photo ID and credit card are both required at check-in. Hotel takes a credit preauthorization but does not accept cash deposits.